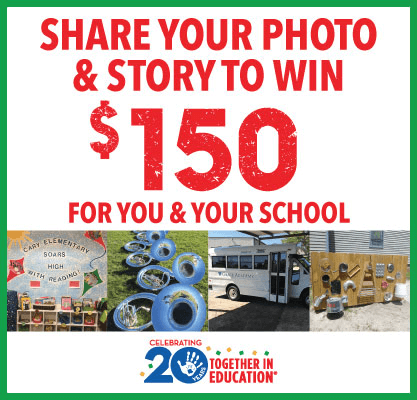 Share your Together in Education story and photo with us! We would love to hear and see your stories! Email us (tie@harristeeter.com) your story and photo describing how your school has used their TIE funds. Stories should be no longer than 250 words. We will be accepting stories and photos from April 1st, 2019 to April 30th, 2019. We will select eligible winners at a random drawing, and award eight TIE Coordinators and their schools with $150 each in Harris Teeter gift cards! Winners will be contacted and notified that they were selected by May 9, 2019. We look forward to learning about how your school is using their funds!